There is always something exciting going on at Dow Diamond! Here you'll find all of the great ticket package specials offered for the current season. 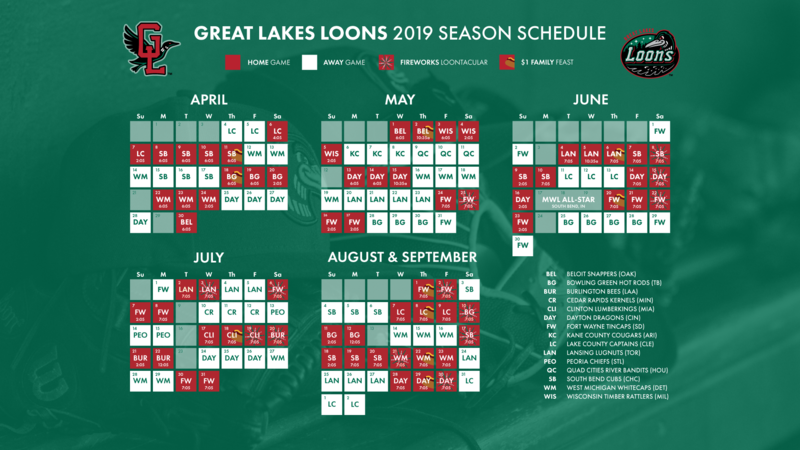 Take advantage of the Loons Celebrity Series Package to attend all five games for one low price! The $50 package includes one box seat ticket to each game (June 7th, June 15th, July 6th, August 8th, August 23rd), a commemorative Celebrity Series card, and a guaranteed autograph during the game. Upon purchase of the Celebrity Series Package, you are also automatically enrolled into the Loons Founders Club. Current Founders Club members may opt-in to the series events at no extra charge as long as they hold a ticket to each game. General public is not guaranteed autograph opportunity. Order online by clicking below or call 989.837.2255 to contact a Loons ticket representative. This limited edition package is perfect for the veteran in your life. The package includes our 5 Game Flex Pack (one ticket each for game on July 3rd, Memorial Day, and three other games of your choice), an exclusive Loons jersey featuring the name of your veteran in the design (first 100), and an on-field jersey presentation prior to the July 3rd game, all for just $95. Call 989.837.2255 or click the link below to contact a Loons ticket representative.